Basically, at about 12:30 am, I was heading to bed (and feeling pretty happy about this timeline as we’re usually up very late the night before a big party or deadline) when I realized my tub was starting to fill with water. We had a drip in that faucet for the last 4 days and had tried to get it fixed right away but it was too complex for our original handyman. I wasn’t necessarily worried about the drip in itself but unfortunately there was also a problem with our pipes. Tree roots had been growing up them! For who knows how many years! And, due to the worst luck of all time, the problem just had to culminate on the worst possible night ever. Because of how our plumbing is (maybe everyone’s is this way?) no other drains work if one is clogged. So no showers would drain (and in fact the showers started to bubble up), and no toilets would flush. This at 1 am on the night before people were needing to wake up very early to shower (two of us for being on camera all day! ), and over a dozen people would be working an exhausting 10 hour day and need bathrooms! Are you kidding me?! Long story short-we couldn’t get a plumber who could fix it at that hour, we had to turn off all the water, and I had to relocate my daughter out of her room. I finally crawled into bed around 3:30 and woke up 2 hours later for one of the longest, hottest, and most tiring days of my life! The whole day, no one could use bathrooms, we were carting water over in jugs from my parents house to wash dishes, the house smelled really bad, and plumbers were sawing into walls to get to the pipes in the background in addition to needing my attention and guidance in order to fix the issue! It was truly the worst possible thing I could ever imagine happening on that night. I was a tired I had never experienced before that morning and to be honest, it was really REALLY hard to work up the energy and positivity I needed for this shoot. BUT! Hopefully that doesn’t show in the video. We threw every little thing we had into shooting and I was just so thankful at the end of the day that the issue was resolved and I got a few more hours sleep the next night. Let’s move on to happier subjects! Like this GIANT pizza sugar cookie! This was one of those recipes that was just so fun to brainstorm and perfect. 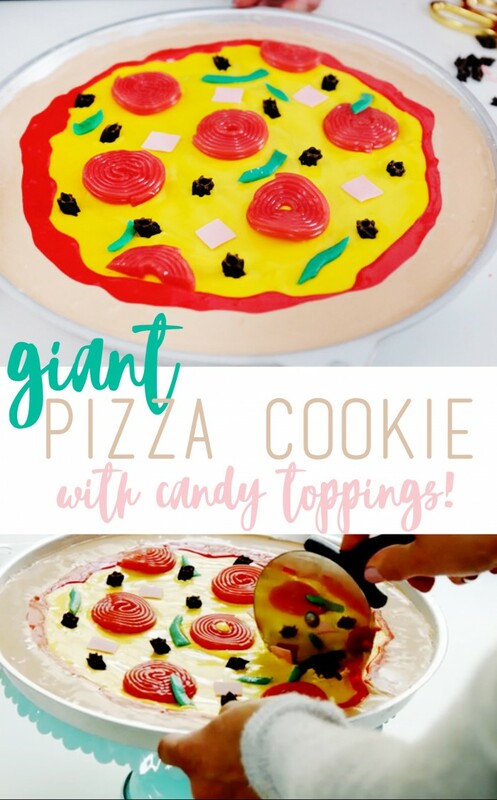 I’ve seen plenty of sugar cookie “pizzas” in my life but they usually have whipped cream and fruit toppings; they don’t resemble an actual pizza! 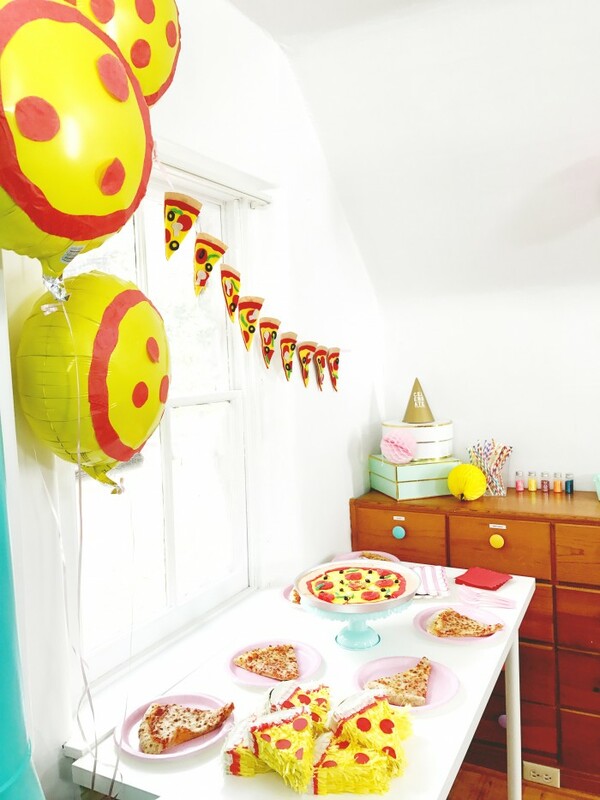 We decided it would be a perfect dessert for a pizza theme and were so happy with how it turned out, isn’t it cute?! We used licorice wheels for pepperoni, bubble tape gum for Canadian bacon, sliced black licorice for olives, cut air heads for peppers, and yellow square pieces of bubble gum for pineapple! Don’t be intimidated by the royal icing–Wilton sells pre-made packages that are a breeze to whip up and put on! 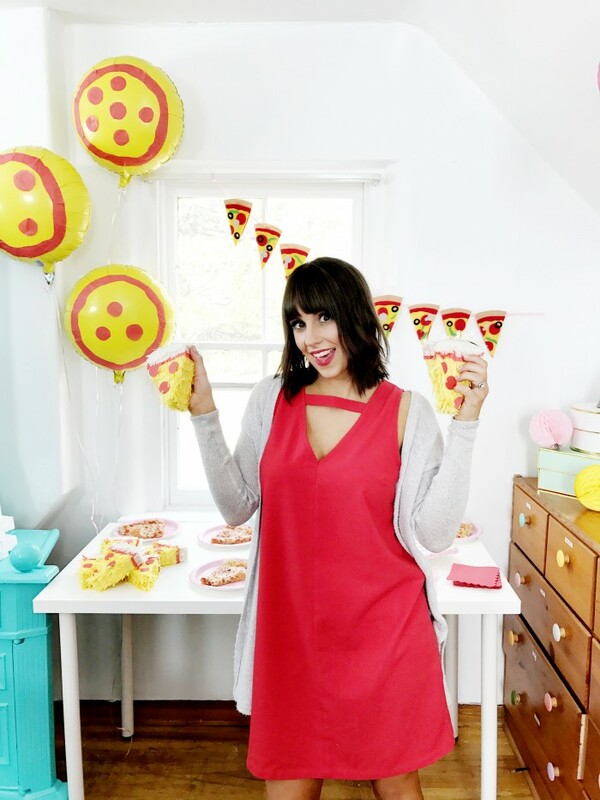 For our DIY decoration, we went with a fun felt pizza bunting! 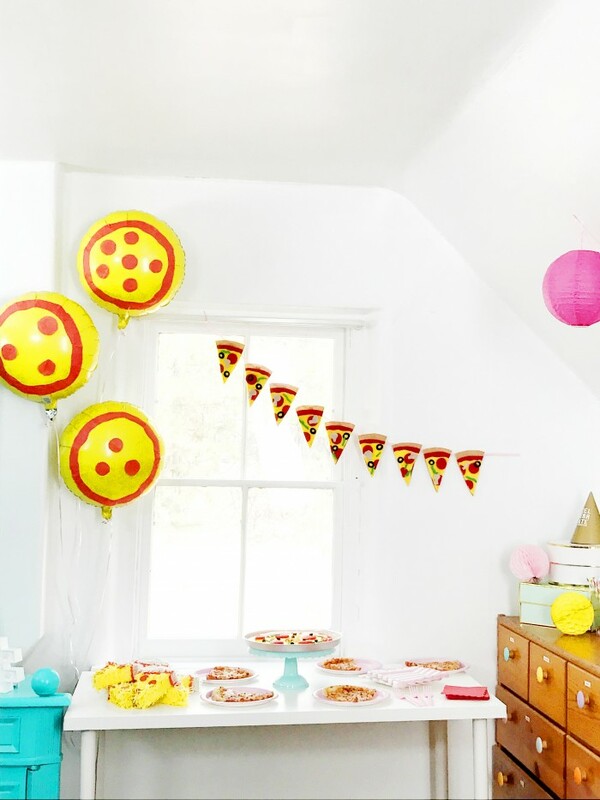 Because pizza slices are the same shape as traditional bunting, we knew this would be perfect! You can customize these to have all your favorite toppings and use this decoration again and again. Make one with us by following the simple steps and grabbing the free template here. 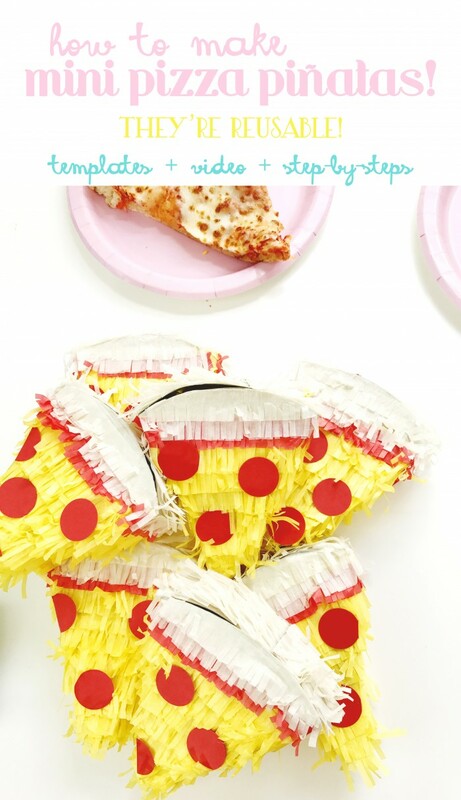 Mini piñatas will always be one of my all-time favorite favors ever! They’re so personal, fun for everyone, and when you follow our directions, they can be used over and over! We filled ours with candy and tiny toys, but the possibilities are endless! Another simple DIY that can be found right here! Well that’s all for our Pizza Party! 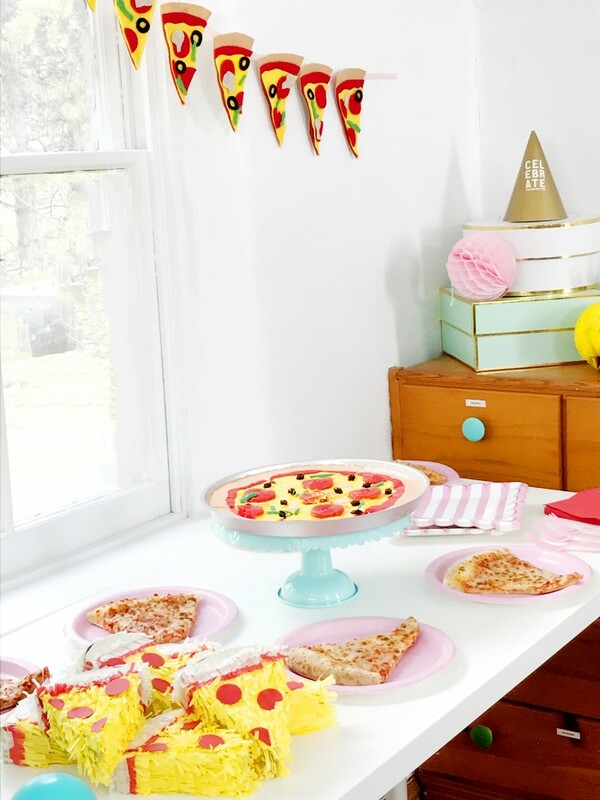 Throw these fun DIYs together with some pizza balloons, a fresh hot pizza, and some colorful accents and you have a delicious bash at your fingertips! Party Starters! How to Throw a Donut Party! Party Starters! How to Throw a Sprinkle Party! Introducing: Party Starters! Videos to Help You Throw the Best Themed Nights Ever!